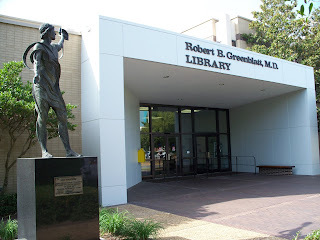 The Robert B. Greenblatt, M.D. Library of Augusta University invites applications for the position of Nursing Information Librarian. The primary focus of this non-tenure track faculty position is to provide health information literacy instruction and research assistance for College of Nursing faculty, students and staff. Please read official job description and apply! The Nursing Information Librarian provides personalized and customized research and education support via an embedded service model to College of Nursing and nursing clinical departments. The successful candidate will develop customized instruction, both in-person and online, throughout the nursing curriculum. This position will be responsible for providing specialized reference and research consultations for nursing faculty and students. Assisting clinical nursing faculty and staff within the integrated health care system find evidence-based resources for patient care and teaching will also be required. The Nursing Information Librarian will work collaboratively with library faculty to support instruction, collection development, distance education and emerging instructional technology within the department and university. This position is responsible for providing information services to distance nursing students and faculty located at remote clinical campus sites. This position has faculty rank and status (non-tenure track). Generous benefits include a competitive health package, Tuition Assistance Program, campus wellness facilities, Perks at Work discount program, Teachers’ Retirement System, and other retirement options. Support for professional development is also available. Salary will be commensurate with qualifications and experience. Augusta is a vibrant community with an affordable cost of living. Schools in the area are desirable and include several magnet schools. Augusta University is developing a new Cyber Institute in town in partnership with the local Army base. Augusta hosts the annual Masters Golf Tournament as well as an annual ironman competition. It also has a lively arts community and is the home of the Greenjackets minor league baseball team, an affiliate of the San Francisco Giants. Augusta is near other attractive communities to visit such as Atlanta, Savannah, Columbia, SC and Asheville, NC. Florida Gulf Coast University seeks an innovative, outgoing Health and Human Services Librarian for a twelve month, non-tenured track position. For the official description and to apply, visit the FGCU jobs webpage. This position is focused on proactively working with health and human services faculty to provide interactive instruction and research assistance for undergraduate and graduate programs in nursing, counseling, health sciences, and rehabilitation sciences. The position also selects and weeds the collection materials for these areas, serves on the Reference Desk, participates in the Mobile Librarian service, and responds to virtual services. FGCU librarians also work on their own scholarly research and serve and participate on a variety of university committees and activities. What’s it like to work at FGCU Library? With 18 librarians and 25 staff, FGCU Library is big enough to engage in sophisticated projects but small enough that all of our departments work collaboratively. We are known for being the most collegial professionals on campus. Our technology support is continually looking for new ways to help students succeed, and the library’s leadership team is always open to new ideas. For example, we just implemented book delivery to faculty and staff offices across campus, and have recently begun a pilot project to purchase high use, high demand textbooks. This is just a reminder that the deadline for submission is this Sunday, July 15th. The 2018 SC/MLA Programming Committee invites you to submit proposals for contributed papers and posters for the 2018 SC/MLA 68th annual meeting in Orlando Florida during October 25 – October 28th. The meeting will be held at the Wyndham Lake Buena Vista Disney Springs Resort. This year’s theme is “Experience the Magic: Libraries of Tomorrow.” Check the conference website for full meeting details and up-to-the-minute information. This year’s posters’ and papers’ theme is “Warp speed ahead: keeping up with trends, managing change, and anticipating the unknown." Beverly began her talk by sitting at a table on the stage to have a conversation with attendees, and she expressed that she is “proud and honored” to be serving as MLA’s first African American President. She is a member of MLA’s Mid-Atlantic Chapter, and currently serves as board liaison to the Diversity and Inclusion Task Force. She stated that diversity “drives excellence and makes us smarter”, and that our profession has not caught up with diversity that is reflected in society. The Diversity and Inclusion Task Force is working to increase diversity within MLA, and it held an open discussion with MLA ‘18 attendees on Sunday, May 20. Beverly also encouraged MLA members to participate in mentorship opportunities through MLA’s Colleague Connection and Mentoring/Expertise Directory, and she emphasized that mentorship is an important part of recruiting and retaining a diverse workforce. She also touched on how MLA’s communities are changing and being reviewed by groups like the Communities Strategic Goal Task Force to ensure that MLA is meeting the needs of its members. Beverly also encouraged us to remain open, flexible and positive throughout the changes that will occur within MLA over the next year. Her personal message to MLA members centers around having open hearts and open minds. Beverly’s open heart surrounds her love of librarianship, and she celebrates diversity and meeting those that she doesn’t already know. Her open mind has evolved over the 20+ years that Beverly has spent in the profession, and she feels that “where the heart goes, the mind will follow.” Beverly also introduced us to Cardiana, a heart-shaped pillow that she carries to collect ideas that MLA members would like to share with her. I had the distinct pleasure of meeting Beverly at the annual dinner for the African American Medical Library Alliance Special Interest Group (SIG), and I am eager to see how MLA thrives under her leadership during the upcoming year. To learn more about Beverly’s talk and other MLA ‘18 perspectives, please visit the MLA ‘18 Annual Meeting Blog and check out Nisha Moody’s ACRLog post on “Amping Up Diversity & Inclusivity in Medical Librarianship”.